We once thought that the genetics of eye colour was simple. Both parents have blue eyes, therefore, all of their children will have blue eyes. Easy peasy! Then science progressed and we realised that it isn’t actually that simple because several genes are involved. The genetics of herbicide resistance was simple. One parent is resistant to a herbicide, therefore, all of the offspring will be resistant because the gene is dominant or semi-dominant. This is true for almost all cases of herbicide resistance and was easy to understand. 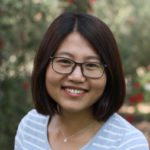 AHRI PhD student, Jinyi Chen, studied the inheritance of trifluralin resistance with target site resistance in ryegrass. She found that resistance is single gene recessively inherited. This means that both parents must have a copy of the resistance gene for the progeny to be resistant. Recessive resistance inheritance is rare in the world of herbicide resistant weeds. Nearly all other cases of target site herbicide resistance involve semi-dominance. This could be part of the reason why trifluralin resistance in ryegrass was slower to evolve than other types of herbicide resistance. However, there is always more than one resistance mechanism. Trifluralin kills ryegrass and other grass weeds by stopping cell division. When cells divide, microtubules pull the chromosomes apart so that each new cell has its own set of chromosomes. Trifluralin interrupts these microtubules. In a previous edition of AHRI insight, we featured Jinyi Chen’s research that describes this target site resistance mechanism. This new research by Jinyi has now confirmed that this target site mutation is inherited as an incomplete recessive nuclear trait. Let’s break that term down a bit, shall we? A recessive trait is one where both parents must have a copy of the mutation for it to be expressed in their offspring. Only offspring that have two copies of the recessive trait will express it. In this case, we are talking about the alpha-tubulin gene. Let’s call the normal gene A and the gene with the mutation that causes trifluralin resistance a. A normal, susceptible weed will, therefore, have the genes AA. The resistant plant will have the genes aa. In this study, Jinyi crossed AA with aa. Therefore, all of the resultant progeny was Aa. If the gene was completely recessive we know that none of these offspring would be resistant to trifluralin. Now let’s introduce the word incomplete. Incomplete recessive means that the Aa progeny will have trifluralin resistance somewhere in between the susceptible (AA) and resistant (aa) parent, and that is exactly what she found. The dose-response curves below illustrate this point. While the F1 progeny have slightly higher survival to trifluralin than the susceptible population, you will notice that normal field rates of trifluralin will control this population. Now, what happens when we cross the F1 offspring with each other? What would you expect from these F2 offspring? 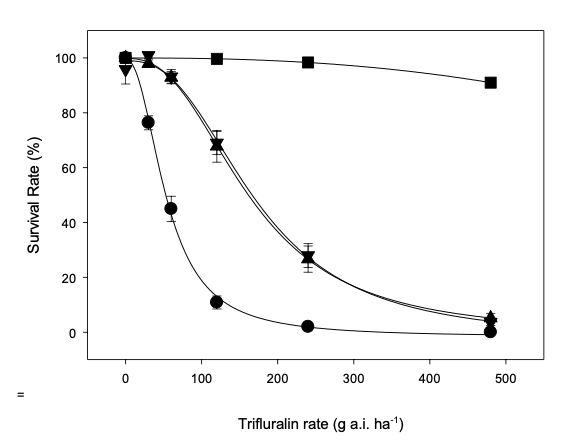 aa should be high-level trifluralin resistance. And that is pretty much what Jinyi found. The only complication being that rate matters in this field of research. Recessive traits spread more slowly through a population than the dominant trait, which is great news. This is for target site trifluralin resistance only, there is always another mechanism! More research by Jinyi has also described non-target site trifluralin resistance in ryegrass. This is excellent, interesting research that shows that target site trifluralin resistance in ryegrass is different from almost all other examples of herbicide resistance in terms of the way that it is inherited. But unfortunately, this is not enough to stop the spread of trifluralin resistance. There is always another resistance mechanism!